“One mango tree in my farm used to yield sour mangoes and I was not able to earn even Rs. 1000 annually! As the tree was more than 50 years old I decided to give a new lease of life to it with grafting. Secondly I am passionate about safeguarding our national treasure of crops therefore I decided to graft native Indian varieties of mango on my mango tree. 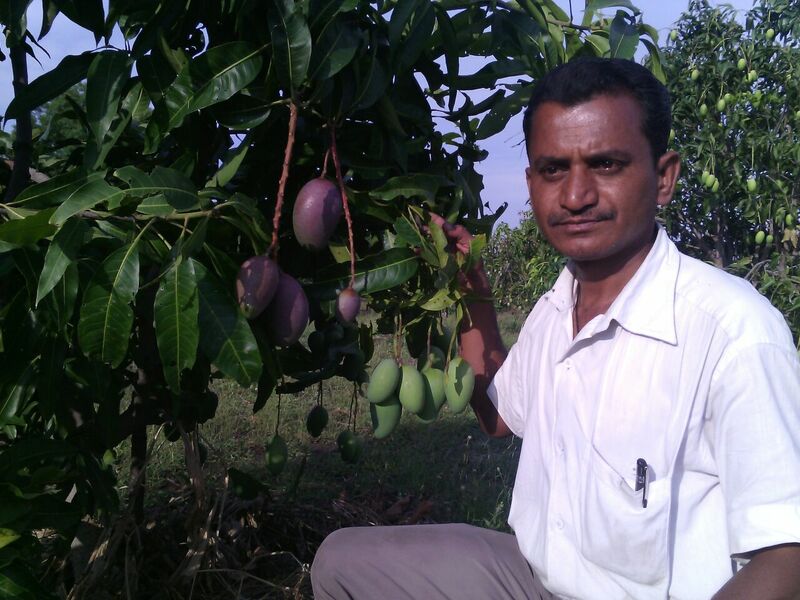 It was only an experiment done with intent to protect the rare Indian mango varieties and revitalize my tree,” says Mr. Ravi Madhavrao Marshetwar, social worker and farmer. His ultimate aim is to protect indigenous weeds, indigenous seeds and indigenous breeds of India. He is based at Washim, Maharashtra. The tree has been successfully restored with 1350 grafts of 51 different mango varieties. 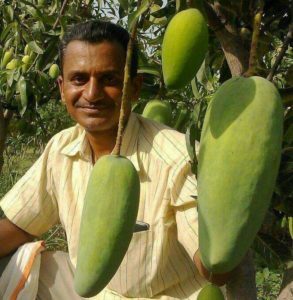 “Now one single tree yields diverse mango varieties and each mango is extremely sweet and tasty. The tree has turned into a ‘Mango Bank’ as it has a unique collection of various plant germplasms. I share the grafts with other farmers who are genuinely interested in mango cultivation.” The tree has become center of attraction of the region. Mr. Marshetwar owns and manages mango orchard having multiple varieties of mangoes grown through ultra high density farming. He has planted 1000 saplings in 2.5 acre farm. He practices cow based farming exclusively. “I have pure gir breed cows on my farm. I make all farming inputs from its dung and urine,” he adds. In order to encourage farmers learn new farming techniques he also organizes free agri tours. Grafting experiment on the mango tree was started in the year 2008. “In the beginning, after couple of rains in June, I cut down all the worn out branches and stems of the tree. There was not a single leaf on the tree! A month later, after new branches sprouted I started planting the grafts till September end. Approximately 700-800 grafts were planted on the tree. Handful number of grafts didn’t survive but rest grew well. I took very good care of the tree and fed it with gir cow based manure and bio-solutions. Next year in 2009, during monsoon once again I grafted another 600-700 grafts,” he elaborates. In two years the old tree was re-energized with 51 new mango varieties. 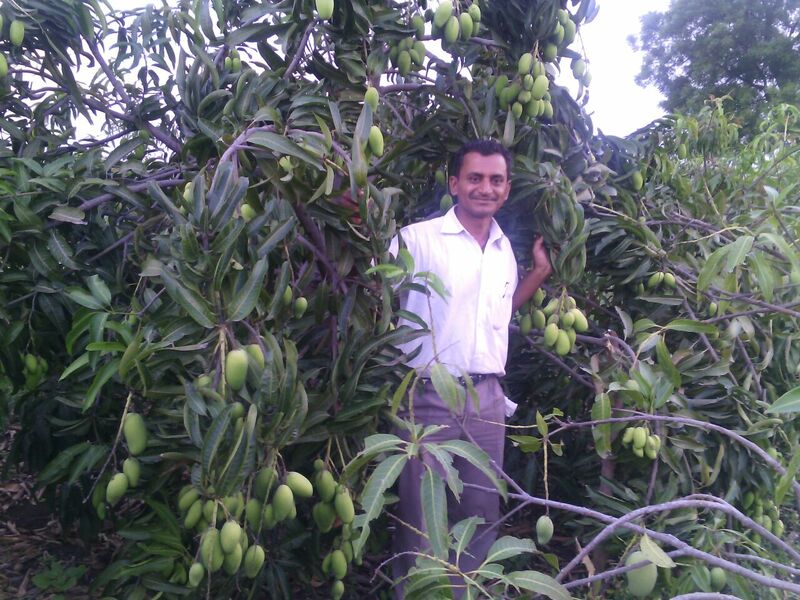 Mango grafts grown on the tree are mostly the local indigenous varieties along with commercially popular variants such as Amrapali, Dasheri, Langra, Kesar, Alphonso, Baganapalli, Totapuri and Chaunsa etc. The tree is nurtured with utmost care and precautions. “I travelled far distance across different Indian states to collect these grafts. Majority of the varieties are rare and endangered!. The grafts were planted as collected and also shared with other farmers because my goal is to protect these varieties from getting extinct and have bio-diversity in my farm,” he highlights. In 2017 mango season Mr. Marshetwar sold mangoes of this tree and earned Rs. 30 thousand.